The ring is pretty but a little different from the picture. The stones are not that close together and is a little too wide on the top. My little finger and middle finger rubs up against it. I'll wear it on special occasions. The colors are great though! I received this ring as a Christmas gift and I love it. The opals are outstanding! I'm fascinated with the way the stones change color which every move of my hand. Never seen so much fire in opals before. It is comfortable to wear on my small hands. Very happy with it. The incredible Five-Star Opal Anniversary Ring fulfills one of our long-held commitments, and celebrates yours. Long ago, we made a vow: We would not produce a five-opal anniversary ring until two very specific conditions were met. 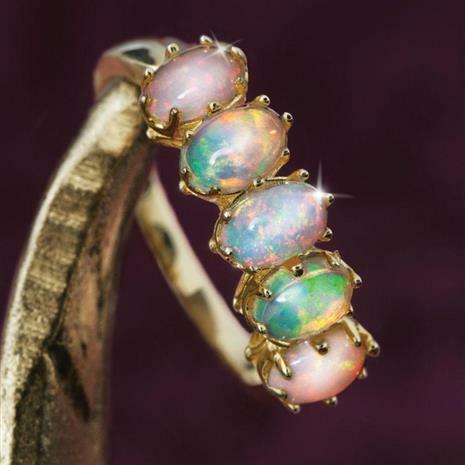 First, the opals had to be of superior quality, with the joyous iridescence to delight all who saw the precious stone's colors dance in the light. Second, the price had to be right, so that we could provide the value Stauer customers expect from us. So when The New York Times style section called Ethiopian opal the "undisputed winner" of the 2014 Gem Show, we decided to investigate. And we were impressed. The Five-Star Opal Anniversary Ring proudly presents the quintet of Ethiopian opals that allowed us to fulfill our vows so you can celebrate the anniversary of yours. Weighing a total of 2½-carats, all five of these gemstones possess the radiant rainbow of color we've been looking for. So how about our price promise? We met that too. Getting an excellent deal on these stones by reacting faster than the old-school retailers in the mainstream jewelry industry so we can make this gorgeous ring available to you for exclusive Stauer price!